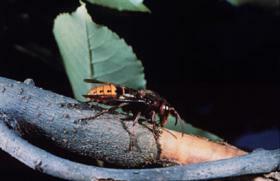 European hornets (Vespa crabro L.) were first reported in North America about 1840 in New York. Since then, they have spread to most of the eastern United States, reaching as far west as Louisiana and the Dakotas. European hornets are also commonly called the brown or giant hornets, and are sometimes mistakenly referred to as "Japanese" hornets. These are the largest and, technically, the only true hornets found in the United States. Figure 1. European hornet stripping bark off a branch. Adults somewhat resemble yellowjackets, but are much larger (about 11⁄2 inches) and are brown with yellow markings rather than black with yellow markings. Queens, which may be seen in the spring, are more reddish than brown, and are larger than the workers. Nests are typically built in hollow trees, but they are often found in barns, sheds, attics, and wall voids of houses. Unlike its cousin, the bald-faced hornet, European hornets rarely build nests that are free hanging or in unprotected areas. Frequently, the nest is built at the cavity opening, rather than deep within. The outside of the exposed nest will be covered with coarse, thick, tan, paper-like material fashioned from decayed wood fibers. Nests built in wall voids may emit a noticeable stench. In the spring, individual hornet queens emerge from hibernation and begin nest building (Figure 2, Figure 3 and Figure 4). Once a queen has produced enough workers to take over this duty, she remains inside the nest producing more offspring. The workers (all of which are females) forage for food, feed the young, as well as expand and defend the nest. Their diet consists mainly of large insects such grasshoppers, flies, bees, and yellow jackets. They continue to enlarge the nest until fall when there may be 300-500 (occasionally up to 1,000) workers. European hornets have a long seasonal cycle. Reproductives (males and females) are produced well into fall. These reproductives mate and the females will serve as the next generation of queens the following spring. As winter approaches, the workers die off. The future queens abandon the nest and seek out shelter in protected places, such as under loose bark, in rotting stumps, and hollows. Although the queens overwinter individually, you may find large numbers of them using the same hibernation site. The abandoned nests are not reused next year. In the spring, each queen starts the nest building process over completely. Figure 2. 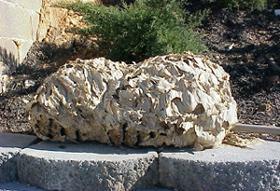 European hornet nest removed from house. Figure 3. 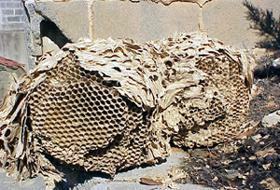 Exposed comb of hornet's nest. Figure 4. 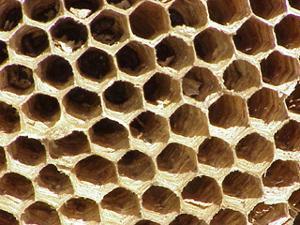 Close up of European hornet nest comb. Unlike most other stinging insects, European hornets also fly at night. They may be attracted to lighted windows (Figure 5) in homes and may beat into the glass with quite a lot of force causing some people to panic, thinking they are trying to break the glass to attack them. This, of course, is not true. Hornet workers are sometimes noticed collecting from the oozing sap of trees. They have been reported to girdle twigs of numerous trees such as dogwood, birch, rhododendron, and fruit trees, probably more for the sap than for the wood fiber. They can also be a minor pest to beehives by preying on worker honey bees. Figure 5. 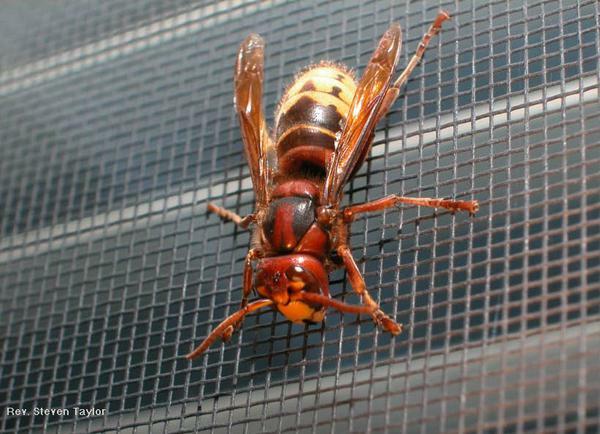 European hornet on window screen. Control is best achieved by applying a pesticide directly into the nest at dusk. Use any aerosol "Wasp & Hornet" spray that propels the insecticide about 10-15 feet. Direct the spray into the nest opening for 5-10 seconds, then move quickly away from the area to avoid any of the wasps that may emerge from the nest. You may need to repeat the treatment the following evening. When spraying, it is advisable to wear a long-sleeved shirt and long pants. Do not hold a lit flashlight or stand near car headlights or other lights; the wasps may fly towards them. If the nest is in a wall void or other inaccessible area in your home, you may want to hire a pest control company to do the work. Whenever possible, remove the nest from the wall. Dead insects and nest debris can become suitable food for dermestid beetles, such as the carpet beetle, which can invade the home and attack garments and other items made of wool, silk or fur. If the wasps are damaging the twigs of ornamentals or fruit trees, apply an insecticide containing Sevin (carbaryl) to the affected areas of the plants. Retreatment may be needed every 7-10 days, depending upon weather conditions. For additional information, see the North Carolina Agricultural Chemicals Manual. For assistance with a specific problem, contact your local Cooperative Extension center.